....Wat KongKha was established around on B.E.2370 (C.E.1827) but not have evidence about the creator. People called this temple "Wat Khok" as former name because of the landscape around the temple has some mounds. However, the name "Wat KongKa" was named because of this temple is located beside 2 canals name is Lad and BangYai. This temple has the principle Buddha Image in the Ubosot named "Luangpho Silalang" this Buddha statue is a Sukhothai style which made by laterite and cover with gold leaf. This Buddha image is very holy and has been the real one when people need support even sick people use holy water from this Buddha image to cure the sick that during the cholera epidemic, holy water was using for curing the sick people. LP Prapas (Phra Maha Prapas Prapaso) the abbot has been doing construction all along but still need fund to procure the material. Many donators have requested the amulet as the thanks from the temple. This abbot is a local person, actually lives in this district. His home is not far from the temple. Before being the abbot here, he stayed at Wat Som-Krieng which is about one kilometer from here. He lost his mother after 7 days he was born. The father is now in the monkhood in Wat Kongkha. He is the third and the youngest of all three children. He studied Pali until finishing level 3, and also passed Naktham Ek. But with the duties of the abbot, he had to discontinue his study. The abbot entered the monkhood when he was 16 as a novice at Wat Som-Krieng until being ordained as a monk at the age of 20 and stayed for 3 years there. Until 2523 B.E. (1980 C.E. ), he moved to Wat Kongkha, which by that time there were only three monks at the temple. One morning full load of people in a van came in Wat Kongkha and requested to see the Abbot. After met the Abbot they said "LP Thuad told us to come to Wat Kongkha." Then explained that they are a group of people who respected LP Thuad and planned to go to Wat Chang Hai in Pattani Province, but before the day of departure all in the group dreamt of LP Thuad talking to them that there is no need to go to the South of Thailand as LP Thuad is in Bangkok at Wat Kongkha. All of them saw the image of LP Thuad sitting in front of old Ubosot. Two days after searching for Wat Kongkha and everything looked like they saw in the dream. On 2nd January 2552 B.E. (2009 C.E. ), LP Prapas the abbot of Wat Kongkha had dreamt of LP Thuad that LP Thuad ordered him to create life-sized image of sitting LP Thuad in meditation posture for Wat Kongkha. Also in the dream, he saw LP Thuad in standing posture with a little bit bend down to the front, right hand holding a walking stick, left hand holding a bag. This is according to 'Sivali posture' which LP Thuad also wanted all of his followers to have this talisman. Phra Sivali according to the Buddha tale is the highly respect for luck, then anyone who has this should be the lucky person. Nowadays, LP Prapas already created the image of LP Thuad lap size of 4.99 meters and 7 meters high in 2542 B.E. (1999 C.E.). After he used the leftover of materials and silver, brass and copper incantation sheets melted to cast the image. For practicing of ritual ceremony the material brought for blessing from many highly respected monks and 9 monks blessed one by one. After brought the whole material to Wat Kongkha's Ubosot for 3 months and performing ritual ceremony before distributed to Buddhist people on 5 December 2552 B.E. (2009 C.E.) on the same date as the celebration ceremony of big LP Thuad image already finished before. - Headlines on most newspapers about Eastern mafia got ambush with war weapons. Vehicle itself almost totally damaged, but the mafia and his associates did not get any wounds. They all had LP Thuad amulet from Wat Kongkha. - About ten years ago, fire on doll factory 'Kader' lost of lives in the incident, one survival had jumped from the 3rd floor also had amulet from Wat Kongkha. Present: This amulet is embedded with the tiny pinchbeck Takrut and the backside has the logo of 50th enthronement anniversary of King Rama 9. Present: The front of amulet has LP Thuad imprint and the back has holy Yant characters. Present: These medals are in shape of a Buddhist boundary stone called 'Pim Sema'. There is LP Thuad imprint on the front. Moreover, the backside bears holy Yant characters. On 2nd January 2552 B.E. (2009 C.E. ), LP Prapas the abbot of Wat Kongkha had dreamt of LP Thuad that LP Thuad ordered him to create life-sized image of sitting LP Thuad in meditation posture for Wat Kongkha. Also in the dream, he saw LP Thuad in standing posture with a little bit bend down to the front, right hand holding a walking stick, left hand holding a bag. This is according to 'Sivali posture' which LP Thuad also wanted all of his followers to have this talisman. Phra Sivali according to the Buddha tale is the highly respect for luck, then anyone who has this should be the lucky person. Nowadays, LP Prapas already created the image of LP Thuad lap size of 4.99 meters and 7 meters high in 2542 B.E. (1999 C.E.). After he used the leftover of materials and silver, brass and copper incantation sheets melted to cast the image. Present: The front of the medal has LP Thuad image in meditation posture and the backside has holy Yant characters with serial number. Present: This holy LP Thuad medal is in shape of a Buddhist boundary stone called 'Pim Sema'. 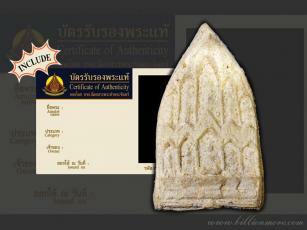 Present: This holy LP Thuad medal is in shape of a Buddhist boundary stone called 'Pim Sema'. The back of the medal has image of the abbot 'LP Prapas Prapaso' of Wat Kongkha.